In general, calling for a firing seven games into the season is an overreaction. Season's are long, they ebb and flow, there are positive and negative streaks which will make teams look like world beaters and world beaten. This is an exception to the rule. After another early playoff exit, with seeming issues brewing on the bench, Penguins fans felt a new level of discord. Fire Blysma! Fire Shero! Fans thinking was that these two had run through course in Pittsburgh. It was time for Shero and Disco to go. This thinking was absolutely correct. Both had become stale. Bylsma had lost the team. Shero had become desperate and left the cupboard bare. 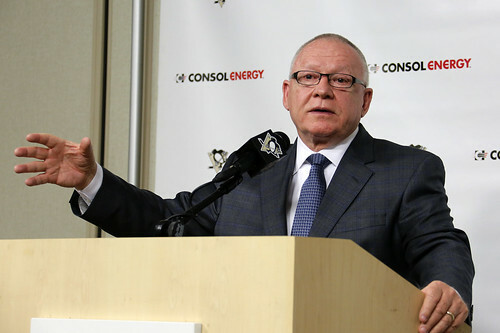 First came the (somewhat puzzling) hire of retread, and previously retired, Jim Rutherford. The former GM of the Carolina Hurricanes was accepted for his pedigree (a Cup win, another Finals appearance) yet it was largely ignored that his postseason appearance record was near identical to that of Shero (three Conference Finals trips, two Finals trips, one Cup win) yet Shero did it over seven years. Rutherford did so over 20. At least it wasn't Pierre McGuire? Then came the coaching debacle. With names floating about, two names had all been but confirmed before 23rd hour scuttling sent Willie Desjardins to Vancouver and Bill Peters off to the Hurricanes. It then came down to the Third Choice, Mike Johnston. And even more controversy followed as word leaked that the coaching choices were hampered by not being able to pick their own assistant coaches. Johnston said all of the right things at his press conference and was met with somewhat cautious optimism. No one knew if he was set up for failure or would be the man to lead the Penguins to the promised land. A promising start had Pens fans feeling hopeful as the team launched to the top of the standings. And then the bottom began to fall out. The Penguins won 66 percent of games when facing a team for the first time last year. That number dropped to 52 percent when facing a team for the second time. It plummeted to less than 36 percent when facing a team for the third time or more. The NHL figured out Mike Johnston and he hasn’t adapted well. Now they’ve had an entire summer to break down film on his simplified systems. That’s also a problem. Better minds are needed behind the Penguins bench. Through the early going of the NHL season, Mike Johnston has shown little to say that he's adjusted his system to break through any adaptation from the coaching ranks other great minds. The lack of great minds forced on him (including failed coaches), outside of Jacques Martin, does not help the situation any. A microcosm of the problems facing the Penguins? A team with Malkin, Crosby, Kessel, Perron, Hornqvist, and even Daniel Sprong (why exactly is he not playing, anyway?) has not scored. A team with this offensive talent is averaging 1.57 goals per game through the early going. After an entire pre-season. Even worse? A power play featuring Crosby, Malkin, Hornqvist, Kessel and Kris Letang is an astoundingly bad 8% success rate. EIGHT. PERCENT. The Penguins have scored 36 goals in their past 22 regular-season games under Mike Johnston. A call for a hot seat this early in the season is usually passed off a fool's rant, passed on by someone who needs to "watch the game" and just wait. The waiting is over. The fans have waited through near a full season of mediocrity from a team that, even when injured, has more than enough talent to be better than this. Johnston will need to outcoach his opponents if the Penguins are going to have success in the loaded Metropolitan division. After 89 games with Johnston behind the bench for the Penguins, that hasn’t happened. Adding another six games to that ledger has changed nothing. By now, fans have seen more than enough to know that if this continues, there needs to be a bigger change before things only get worse.